George McHale, or “Mac” as Indy called him, was an old and trusted friend of Indy, and Mac so happened to be visiting Indy when the Soviets kidnapped both of them and forced Indy to help them locate a valuable relic hidden in Hangar 51. But when Indy tried to escape, Mac revealed that he was actually working for the Soviets, having been seduced by the Soviets’ offer of settling his heavy gambling debts in exchange for his services. Mac helped the Soviets throughout their quest for the crystal skull, even after tricking Indy into believing that he was actually hired by the CIA to spy on the Soviets. Mac eventually showed that his allegiance was only to his own greed, allying himself to whichever side he thought was winning the quest for the lost city of Akator, where untold treasures were said to be hidden. Scarf – It is a piece of Colonel Vogel‘s (“Indiana Jones and the Last Crusade”) whistle lanyard. I had the idea of creating a George McHale figure for quite a while. I had Gung Ho’s head as an extra part from an earlier custom, and it was suitable since Gung Ho had a moustache that resembled McHale’s. Gung Ho’s hat was cut off, and epoxy was used to sculpt the headtop. But it was some time before I found the suitable torso for my custom work. 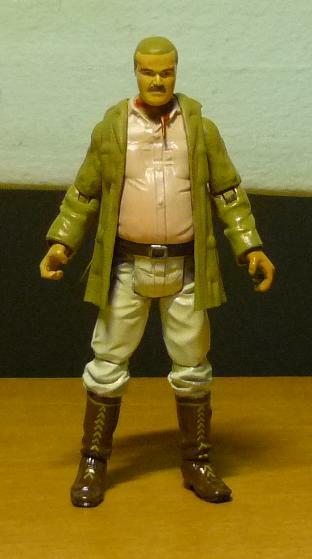 McHale is a rather portly guy, and it was only recently that a similar sized figure was released, Star Wars’ Willrow Hood, whose torso I used for McHale. But as this torso lacks a collar and neckline, I decided to create one by simply transplanting over the upper torso of an Indiana Jones figure. Those who have watched “Indiana Jones and the Kingdom of the Crystal Skull” would already know that Mary Williams is actually Marion Ravenwood, Indy’s girlfriend from “Raiders of the Lost Ark”! Indy and Marion had originally planned to get married, but differences between them drove them apart again. Unknown to Indy, Marion was pregnant and later gave birth to Indy’s son. She went to live in England and got married, taking on the name “Mary Williams”. In 1957, Mutt Williams sought Indy’s help to locate both his mother and a friend of Indy’s after they were kidnapped by unknown persons in Peru. Only later after Indy and Mutt were captured by the Soviets did Indy find out that Marion was Mutt’s mother, and that he had a son. After some initial bickering, romance once again blossomed between Indy and Marion, and two of them finally got married upon the resolution of the crystal skull affair. And this would be my third Marion custom figure, having earlier created Nepal Marion, and Marion in white dress. Essentially, KOTCS Marion has nearly the same recipe as Nepal Marion. Marion’s torso and waist was transplanted onto Belloq’s legs. Marion’s vest was sculpted by first pasting pieces of paper onto the torso to create the vest flaps, and then sculpting the vest itself using epoxy. A bit of dremeling was done to create the neckline. Epoxy was also used to sclupt the collars and sleeves foldups. And no additional changes was made to Marion’s head, although this implies that Marion had not aged a single day during the twenty-one years between “Raiders of the Lost Ark” (set in 1936) and “Kingdom of the Crystal Skull” (set in 1957). If you had watched KOTCS, you can see that this may as well be true. Indy and gang on the run from the Peruvian indians. 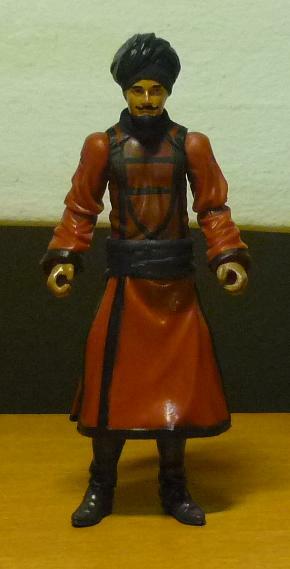 Try and guess who I have in mind to showcase next for my awesome Indiana Jones custom figures. 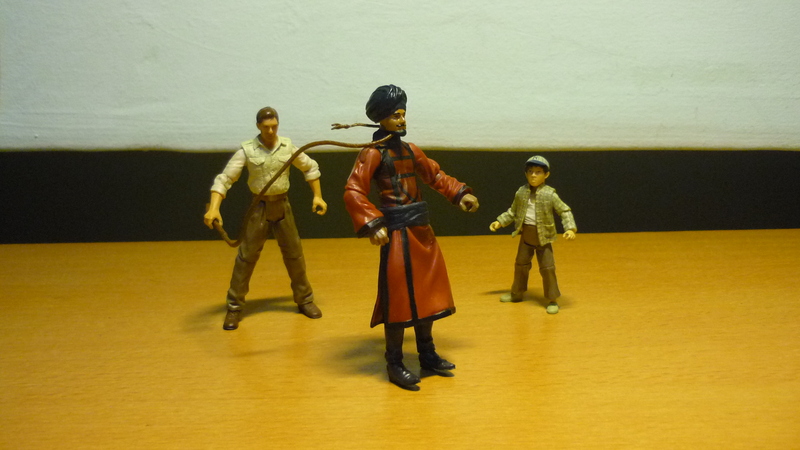 Hello, I present to you my next Indiana Jones custom figure. In 1935, following his escape from a blotched artifact exchange in Shanghai, Indiana Jones arrives at an Indian village which had been terrorised by the Thuggee cult from the nearby Pankot Palace. Indy decides to investigate the villagers’ plight, but after he asked several offensive questions about the cult during the palace dinner, the Thuggees decided to silence Indy by sending an assassin into his room during the night. I have acquired a couple of extra Thuggee Temple Guard from CSC, and I realised that it was possible to customise the Thuggee Assassin from the Temple Guard since they wore the same red costume. Only the torso was different, which came from Mutt Williams, painted in a similar red along with the black patterning as seen in the movie. The turban came from the head of the Chief Thuggee Guard, while for the head again I used another Mutt William head. With the painting of face colours and moustache, the original face would not be recognisable. The Thuggee Assassin sneaks up from behind while Indy sulks in his room. The Thuggees are experts at strangling their victims. After a brief struggle, Indy gains the upper hand! Short Round tosses the whip to Indy, who lashes it around the Thuggee Assassin’s neck. The whip gets caught in the ceiling fan, which pulls the assassin into the air and hangs him to death.